Offering sleep apnea treatment alternatives to CPAP, Karen Yee DDS and Ronald Hwang DMD restore restful sleep to San Francisco Bay Area patients. Are you tired even after a full night of sleep? Sleep apnea is a potentially life-threatening sleep disorder characterized by repeated pauses in breathing during sleep. It is often accompanied by heavy snoring or choking sensations. Breathing pauses can last anywhere from several seconds to minutes, and happen as often as 30 times or more per hour. Ongoing disrupted breathing causes an imbalance between the carbon dioxide and oxygen levels in the bloodstream, as not enough carbon dioxide is exiting and not enough oxygen is entering the body. Sensing this imbalance, the brain sends a message to the body, telling it to wake up to restart breathing. People with sleep apnea will partially awake as they struggle to breathe. Because people with sleep apnea don’t always completely wake up during the episodes, they are often unaware they have a sleeping disorder and it can remain undiagnosed. There are two main types of this disorder; central sleep apnea which occurs when the brain fails to send important signals to the breathing muscles, and obstructive sleep apnea (OSA) which occurs when air cannot flow through even though the body is still trying to breathe. Obstructive sleep apnea is far more prevalent and easily treatable by a specially trained dentist. It is very important to seek medical attention if sleep apnea is suspected. For many sufferers, sleep apnea disrupts sleep enough to affect their energy level, mood, focus, memory, and other mental tasks. This can have a dramatic effect on their ability to perform at work or school and performing daily activities like driving. Sleep apnea is also a very serious medical condition that can affect other areas of your health. When your breathing stops during sleep, your blood carbon dioxide level skyrockets. Your heart has to pump harder and faster to compensate for the lack of oxygen. Sleep apnea has been linked to a series of serious heart-related conditions, and should be investigated by the dentist at the earliest opportunity. Common sleep apnea symptoms can include heavy snoring, gasping for air while you sleep, severe early morning headaches, sleepiness in the daytime, and insomnia. The following simple questionnaire may also help you determine if you suffer from sleep apnea. This is, however, just a self assessment, and a proper diagnosis should always be made by a trained professional. Do you snore loudly enough to be heard behind a closed door? Do you sometimes fall asleep while sitting, reading, or watching television? Do you sometimes fall asleep while sitting in a public space such as a theater or a meeting? Do you fall asleep as a passenger on a car ride that lasts one hour or more? As a driver of a car, do you doze while stopped for a few minutes in traffic? There are many different sleep apnea treatment options based on the exact diagnosis and the health of the patient. We begin by getting to know you and conducting tests in order to investigate, diagnose, and pinpoint a suitable treatment. For some patients, devices called Continuous Positive Airway Pressure (CPAP) masks have traditionally been used to keep the patient’s airways open while they sleep. But now there are less intrusive options for those looking to stop snoring and sleep more soundly. Oral appliances gently keep the lower jaw forward and are very effective in preventing the tongue from blocking the main air passage. These dental devices are approved by the American Academy of Sleep Medicine for patients who can't tolerate CPAP. They are gentle, easy to wear, and often help patients avoid unwanted surgeries. If necessary, we can work with a surgical specialist to modify the airway in several different ways, sometimes involving tonsils, nasal passage, uvula, or the tongue. Surgery has an impressive success rate and is straightforward for the dentist or oral surgeon to perform. For young patients who are still growing, our specially trained orthodontist can provide airway and expansion orthodontic services as a preferred treatment for OSA. 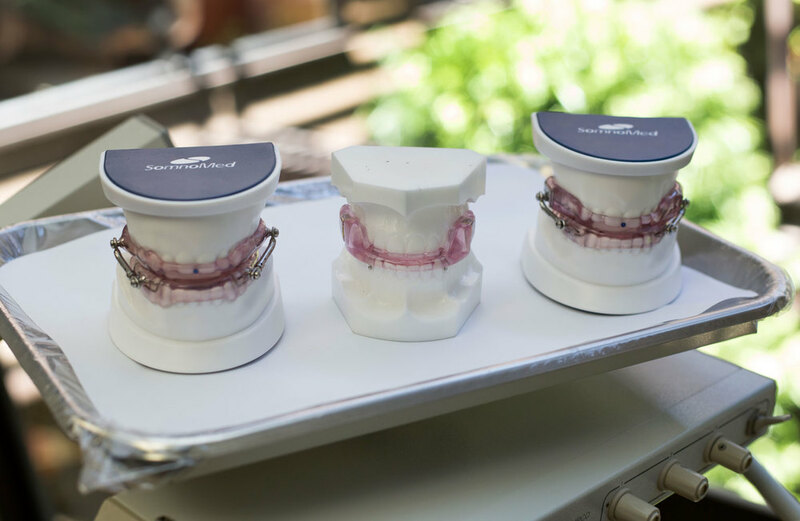 New techniques in orthodontics allow specialists to expand the oral space for OSA patients, balancing proper bite with improved air flow. But the best solution is the one that is right for you. So it’s important that you have a properly trained dentist work with you to determine your path to better sleep. I sleep normally and soundly for the first time in years.